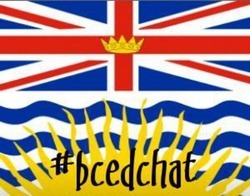 In July of 2013, I founded #BCedchat, the official Twitter chat for the province of British Columbia. The development and maintenance of this chat has been both challenging and rewarding for myself and the moderation team. We have hosted over 25 chats to date, with between 500-1000 tweets in the hour that it takes place, bringing together a professional learning community within individual school districts and across the province. The hashtag is also now used as the official space to discuss professional development matters that concern British Columbian educators.